An election official counts votes during an election for Jakarta's governor in Jakarta, Indonesia, Feb. 15, 2017. Perhaps because Indonesia's democracy is still young, just 19 years old, Indonesians seem palpably excited about the chance to vote. The country grants extraordinary suffrage to its far-flung citizens. Even inmates in the nation's prisons voted in Wednesday's regional elections across Indonesia, including the hotly contested race for Jakarta's governor. Although the military can't vote in Indonesia, inmates who are serving sentences of fewer than five years can. And thousands of them voted at orderly, even festive, booths at prisons around Jakarta Wednesday. Their votes largely mirrored the split in total ballots in the Jakarta election, in which incumbent governor Basuki "Ahok" Tjahaja Purnama won about 43 percent, former minister Anies Baswedan picked up about 40 percent, and Agus Yudhoyono, son of a former Indonesian president, took the remaining 17 percent. Since no one won at least 50 percent of the vote, Ahok and Baswedan will proceed to a runoff in April, according to Jakarta's electoral rules. Inmates at the Pondok Bambu women's prison in East Jakarta started lining up around 7:00 AM to punch their ballots. Although there are more than one thousand prisoners at the facility, only 157 of them were eligible to vote in Jakarta. They were called up in rounds to vote behind cardboard screens. 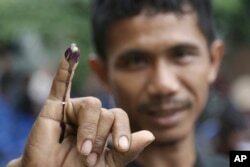 On the way out, they dipped their fingers in navy blue inkwells, stained fingers being a proud sign of having voted across Indonesia. "We've been following all the debates on TV from inside here," said Latifa, a middle-aged woman who, like most of the inmates at this prison, was arrested for drug offenses. "We've been up since 6:00, and we're really excited to vote." "It's not just because I'm Christian too," said Ella. "He's just the best man for the job." Her husband is in a different jail, and her kids currently live in her sister's house in Jakarta. "I want my kids to grow up in Ahok's Jakarta," she said. Another prisoner, Maya, stood in the voting line while feeding her nine-month old baby, who came with her to prison when she was sentenced last fall. She quietly shook her head and told VOA, "I could never vote for Ahok after what he said." She was tight-lipped about which of the remaining two candidates she preferred, but said, "I'm not excited for this election. I just feel it's my duty to vote." At the day's end, it was actually Yudhoyono and his running mate Sylviana Murni who edged out the lead in Pondok Bambu, with 55 votes to Ahok's 51. An Indonesian man shows his ink-stained finger after voting in Jakarta, Indonesia, Feb. 15, 2017. Voter turnout in the Jakarta election was reported to exceed an impressive 80 percent of its 7.1 million eligible voters. There were 13,000 polling stations set up across the city for the occasion, which is a public holiday in all of Indonesia. "You have to understand, voting is still really fun for us," said Ophan Lamara, a travel agent, speaking at his neighborhood voting booth in the East Jakarta neighborhood of Cipinang Indah. "We're a new democracy. We're like kids in a candy store." He had come with his two young kids, like many of the civilian voters in Jakarta today, who made election day a family affair. Every polling station, including the ones in prisons, have a steady flow of snacks, like fried tofu and banana leaf-wrapped rice, a crucial element of any Indonesian undertaking. The General Election Commission (KPU) encouraged Jakartans to register to vote in September and October with whimsical posters featuring an anthropomorphized Monumen Nasional as a mascot. "Ayo, memilih untuk Jakarta," they said: "Vote for Jakarta." And votes are counted in public at polling stations, with the ballots held up for any doubting observers. "Indonesia is very democratic, and we are proud to put in the work to make this happen," said Yuliana, a security official at Pondok Bambu. There were a few famous faces much sought after and ultimately missing at the women's prison polls: Angelina Sondakh, a pageant queen turned politician who was arrested for bribery; and Jessica Wongso, perpetrator of last year's infamous "cyanide coffee" murder. There were 178,063 prisoners in Jakarta as of 2015, but they come from all over Indonesia, so only about one-fifth of them were eligible to vote in the gubernatorial election. There were also 16,000 policemen deployed on city streets on election day, according to Reuters, due to concerns that hardline groups might get in a few more anti-Ahok protests. But the day was largely uneventful. At the high-security Cipinang men's prison in East Jakarta, inmates even ground and served free coffee for polling and security officials on-site. Ahok won the most Cipinang votes. The question of suffrage for convicted criminals is by no means universal, and it doesn't exist in some of the world's oldest democracies, like 48 American states and all of Britain. It was no easy feat even in Indonesia. Prison voting requires extra security, preparation, and coordination. "We have been planning this for a year," said Dian Hepirashidasani, of KPU. And they will have to do it all over again, when Ahok and Anies rematch in April.